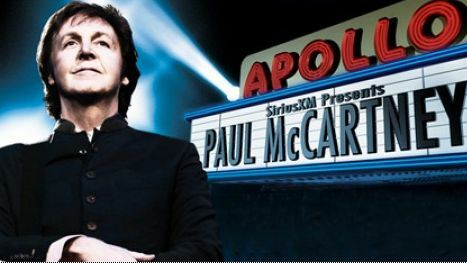 Paul will perform at Harlem’s world famous Apollo Theatre for the first time at an exclusive, invite-only concert for SIRIUS XM listeners. The concert will celebrate SIRIUS XM reaching 20 million subscribers, a milestone the company expects to achieve shortly. The concert, which will be held on Monday, December 13 at 8:00 pm ET, will feature Paul performing songs from his unrivalled back catalogue, including many Beatles, Wings and solo classics, for SIRIUS XM subscribers. SIRIUS XM will broadcast the concert live nationwide as well as offer a few lucky subscribers the opportunity to attend the unprecedented event. SIRIUS XM will also launch “Paul McCartney’s Band on the Run Radio,” a month-long 24/7 commercial-free music channel devoted to McCartney’s legendary and expansive music catalogue, including music from his solo records, tracks from every Wings album as well as the iconic songs he recorded with The Beatles. “Paul McCartney’s Band on the Run Radio” will launch on Monday 29th November at 3:00 pm ET and air through Sunday, December 26 at 11:59 pm ET on SIRIUS channel 33 and XM channel 27 and SIRIUS XM Bootlegs, SIRIUS Internet Radio, SIR 812, and XM Radio Online, XMRO channel 90. The channel’s launch coincides with the recent re-issue of Paul McCartney & Wings’ number one album from 1973, Band on the Run, the first title to be released as part of an extensive overhaul of Paul’s complete catalogue of solo recordings. The month-long channel will also feature a behind-the-scenes look at the making of this landmark album, hosted by Paul himself, as well as newly-discovered live performances of Wings tracks recorded at Abbey Road Studios from The Paul McCartney Archive. Please visit www.sirius.com for full competition rules. The concert will air nationwide live on five channels including “Paul McCartney’s Band on the Run Radio,” Howard 101, one of Howard Stern’s two exclusive SIRIUS XM channels, Classic Vinyl, The Coffee House and ‘70s on 7. Pour résumer l'Apollo Theatre est la salle culte de Harlem. Avec ses 1.750 places cette salle a vu les plus grands noms de la musique "Black". Sarah Vaughan, Billie Holiday, Ella Fitzgerald, James Brown, Jackson 5 pour n'en citer qu'une partie. Un lieu culte pour un concert qui va etre retransmis en direct sur la radio Sirius. Apollo Theatre, ancien Hammersmith Odeon où les Wings, Beatles, ont autrefois joué. Etant un vrai taré de la musique "Black" Américaine période "60/70". Le fait que le Mac va pour la première fois puisse marcher sur les planches de cet endroit culte est juste... Incroyable. hum hum, peut-on espérer des changements dans la set ?